The film is a take on the art of storytelling and filmmaking and how perspectives define the way we see things, and our assumption of them about being good or bad. Skip the movie if abstract scares you, for this will not only scare but also confuse. But do watch it if the intricacies of human mind and relationships intrigue you. Must watch for those interested in the art of filmmaking or storytelling too. They just go past in a blur, without any real markers. The lines sound forced, and Kapoor says them without investing anything in his character. Did he find an outline which he wanted to fill, or was he left, like us, looking for one? And we come away without being any the wiser. Who is K? Why is he the way he is? Questions, questions. X: Past Is Present has its share of dull, grey patches, heightened by the hollow philosophy on life and art that K spouts in his weaker moments. But these are few and far between. From the heady to the humdrum, the film drifts much like the protagonist himself, but, like him again, makes it to a reasonably meaningful destination.Watch X: Past Is Present for its delightful cheekiness. X :Past Is Present tries too hard at being modern-day filmmaking but in the lieu forgets audience’s commercial tastes. In one of the dialogues, K says that he does not believe in God but in Science. Well, God, Science and Filmmaking, all three seem to be a lost cause here. I will go with a 1.5/5 for it! 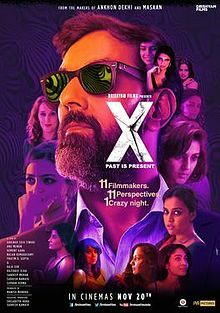 Story: X – Past is Present is a 2015 Indian collaborative feature film directed by a team of eleven filmmakers including Abhinav Shiv Tiwari, Anu Menon, Nalan Kumarasamy, Hemant Gaba, Pratim D. Gupta, Q, Raja Sen, Rajshree Ojha, Sandeep Mohan, Sudhish Kamath and Suparn Verma. It will feature actor-director Rajat Kapoor and Anshuman Jha in the lead. X is not an anthology,but one whole story with the eleven directors making sections of it.